Aguelzim mountain is located above the Azzaden valley and offers stunning views over the Atlas summit. Due to the elevation, the trek is considered one of the hardest, but also one of the most beautiful. 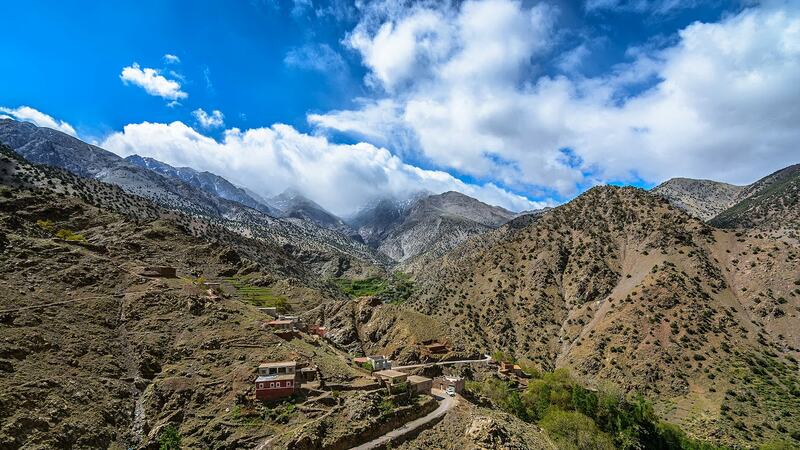 This is an amazing three day 2 nights round trek up to Mount Toubkal summit, using a circular way, with a final ascent of Mt Toubkal on day 3 before heading back to Marrakech. Note: This trek can be combined with the Sahara desert, if you are keen on visiting both. After your transfer from Marrakech to Imlil (1,780m), you will set off on a 6 hour trek out of the Imlil Valley and into the Azzaden Valley. Along the way you will pass Tizi n’Mzik at 2,450m, the refuge at Azib n’Tansoult and the Ighouliden waterfalls. Overnight in the Lipeney mountain refuge at 3,000m ( or before at Azib n Tamsoult). Today involves a fairly stiff climb out of the Azzaden Valley to the Toubkal refuge over the Aguelzim mountain pass at 3,560 m. Lunch will be taken with spectacular views over the Atlas mountain range. Overnight in the Toubkal refuge (Neltner Hut) where you will likely be sharing a bunk room with other trekkers tackling Toubkal early the next morning. Up early for the climb up Toubkal (4,167 m) from where, clouds allowing, you will have wonderful views over the Atlas range and the Sahara desert. T hen a long way back down past the refuge and the well-worn path back to Imlil. This is a fairly long day with 8-9 hours of trekking, involving 900m up then almost 2,500 m back down to Imlil. You will normally be dropped off at around 5.00 pm in Marrakech.